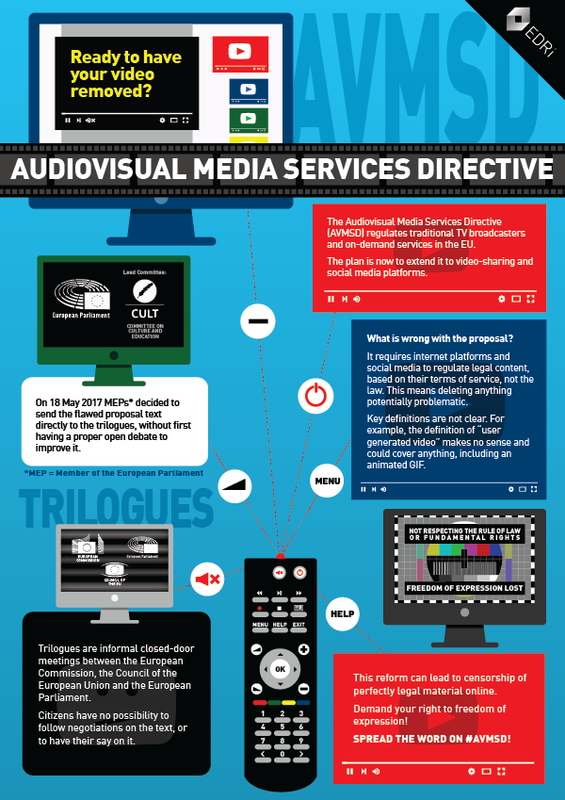 On 25 May 2016, the European Commission proposed to reform the Audiovisual Media Services Directive (the “AVMS Directive” or “AVMSD”). The current AVMS Directive (2010) is the European Union (EU) legal framework that regulates traditional TV broadcasters and on-demand services in the EU Member States. The AVMSD contains rules on audiovisual advertising; jurisdiction over providers; promotion of European works; and on providers’ obligations with regards to commercial communications, protection of minors from potentially harmful content, fight against “incitement to hatred”, among other measures. The new proposal broadens the scope of the Directive to cover the regulation of video-sharing platforms and potentially even other social media companies. European Digital Rights (EDRi)’s main concern is the lack of clarity and safeguards for respecting the rule of law and protecting fundamental rights. The AVMSD fails to clearly draw the line between different concepts and different services. A lack of clarity affects competition, freedom of expression and opinion, the fight against illegal material online and the protection of children online. EDRi is working with the EU institutions throughout the different stages of the legislative process. In this document pool, you will find the relevant information, documents, and analyses on the AVMSD. We’ll be updating this document pool as the process advances. Last update: 20 September 2017. Find more information and documents in PRELEX (the EU Database on preparatory acts), OEIL (the European Parliament’s Legislative Observatory), Council’s document register, IPEX (the Interparliamentary Exchange Platform) and Statewatch news.